As it has become more mainstream, various projects have begun to show us that blockchain is capable of much more than revolutionizing the current financial systems. We’ve seen promising projects seek to disrupt international finance but also worldwide systems of healthcare, voting, and transports, to name a few. It may come as a surprise to some, but blockchain may even revolutionize industries such as journalism, media, content writing, and knowledge sharing. How can blockchain do that, one might ask. To answer this question, one must first understand the basic principles of the blockchain, as well as determining the most pressing issues that journalism and media face today. Some of the problems usually associated with media and journalism, in general, are lack of transparency and accountability, as well as various degrees of censorship. As we all know, governments, corporations and other types of institutions can have a powerful effect and even control the media. The subject gets even more complicated when one tries to comprehend the relevancy of media actors on the Internet, as seen by the increasing number of fake news posts. Then there are the potential problems that arise from news publications being restricted to generating income through advertising. By using blockchain, journalism and the news and media industries can become more transparent and a lot more trustworthy. One of the main concepts of blockchain is immutability, which means that nothing disappears, and nothing can ever get lost (the content gets distributed over hundreds or even thousands of computers). Since everything in the blockchain is public, not only can everyone get involved, but everyone can be held accountable for accuracy and quality. At the forefront of blockchain technology leading the way towards a better future for journalism are two very interesting projects called Lunyr and Civil. In this article, we will discuss their philosophies, their methods, and their underlining technology in order to determine how they can change the future of knowledge sharing. 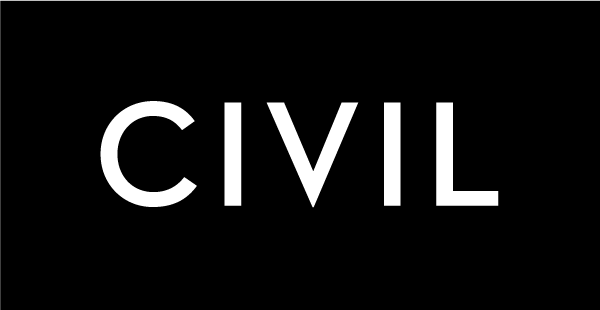 According to its website, Civil is a “decentralized marketplace for sustainable journalism.” The building blocks of the platform revolve around the concept of blockchain and heavily rely on its own, bespoke cryptocurrency. Civil uses a system of “tokens” that will fund the development of the platform but will also compensate writers, editors, or whoever brings value to said environment. One can regard Civil as a combination between a publishing tool and a crowdfunding platform. The cryptocurrency plays a huge role within the Civil ecosystem as it gives members a stake in something that could increase in value. A very good analogy is to think about this process like a publisher would; by giving their journalists a share in the company in addition to their base salary. The token is CVL and is powered by a token-curated registry (TCR). Civil employs a council that is part of the TCR that can review challenges and helps protect against various unwanted interests. 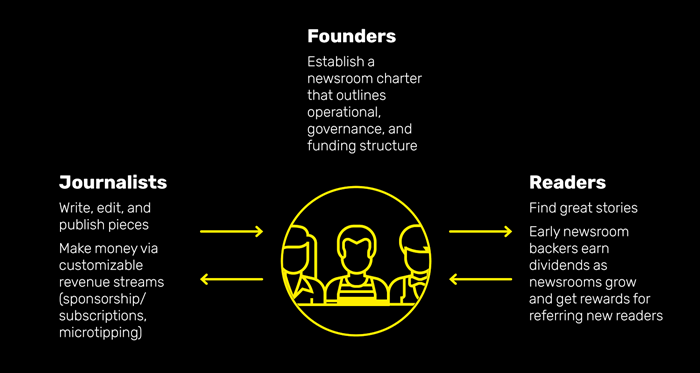 Since it is a decentralized communications protocol, one of Civil’s main goals is to help strengthen the relationship between the public and news sources. By using blockchain, the platform is also a lot less prone to censorship and intellectual property violations (since there are no centralized or external parties which could control it). Another interesting aspect is the fact that Civil is built atop the Ethereum blockchain which results in openness, decentralization, self-governance, and immutable records. In short, it’s a platform that is owned and operated by journalists and the public alike (and cannot be controlled by the government or other institutions). Lunyr is a centralized crowdsourced encyclopedia. According to its official website, Lunyr is a “decentralized Wikipedia on the blockchain.” One of the main aspects of this platform is that users are rewarded for peer-reviewing and contributing information. It aims to create an environment where verified and reliable information can be effortlessly found and distributed. It has some of the basic principles of Wikipedia, but it’s secured using Ethereum blockchain technology. All content on the Lunyr platform will be available for free distribution or referrals in order to grow the knowledgebase. One of the project’s highlights is the knowledge base API. The team behind the project hopes to develop a knowledge base API which will further pave the way towards creating the next generation of decentralized applications. Not only that, but the API might prove to have valid use cases in fields such as artificial intelligence, augmented reality, virtual reality, and many more. Just like in the case of Civil, Lunyr’s tokens (LUN) play a key role in the network. In short, the tokens provide incentives so that everything that the network participants work toward the common good of the platform by providing accurate and reliable information. The system works in such a way that all the content is subject to a thorough and mandatory peer review process to determine its reliability and accuracy. As mentioned before, the tokens will play a huge role towards ensuring that the peer reviewers act in the best interest of the whole ecosystem. Considering everything that these two promising projects hope to achieve, it might look like the future is going to be a bright one, even though there will definitely be various setbacks and challenges. For these two projects, in particular, it might be very important to partner up with important institutions to continue the development. That will be one of the more important marketing challenges that Lunyr and Civil have to overcome, as the complicated nature of blockchain tech is not only difficult to comprehend, but has also been associated with negative things that revolve around the crypto sphere these days such as hacks, attacks, frauds, scams, etc.